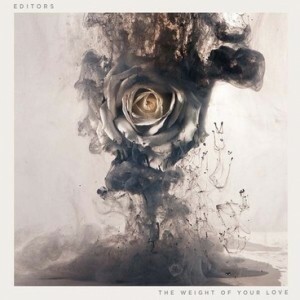 Editors – The Weight Of Your Love | NoCoda. What It Sound Like: Dark-tinged alternative (but certainly with more sunlight than past releases), adding post-punk nods to Interpol and the like, but with warmer melodies, lush orchestral accompaniment, and more guts – plus a dash of (get out your pitchforks) Coldplay. I want you to realize when I’m gone. You are the only thing I want to own. You’re the life of another world. It breaks my heart to love you. It’s always a delight when a band releases their fourth record – especially when the expectation level is, well…unexpected. You’re past the debut record and have survived the sophomore slump, and the experimental third record is under your belt. Where do we go from there? A return to form? Something even stranger? Editors stormed out of Britain in two-thousand-five with their wonderful debut The Back Room, not necessarily sounding like an exact second coming of Joy Division – but with their brand of dark indie rock paired up with lead singer/guitarist Tom Smith’s deep delivery – you couldn’t shake the chills of Ian Curtis crawling on your skin. We dipped further into the epic realm with two-thousand-seven’s intense An End Has A Start, and then were given a complete out-of-left-field curveball with the immensely dark, electronic, synth-heavy and minimal-guitar In This Light And On This Evening in two-thousand-nine. Truthfully, I have yet to really have a clear opinion on that record, even four years later. A four year break from that year to this year’s release of The Weight Of Your Love was well deserved and essential, and sees Editors making their most accessible and pop-laden record to date. You think that’s a negative? You’d be sorely mistaken, as The Weight Of Your Love may just be the best thing they’ve released yet. Alright, alright – I won’t say it’s better than The Back Room, but it’s certainly on par. It’s a home run. Two Hearted Spider sees them channeling their inner U2, while Nothing backs up Tom’s graceful delivery with strings and strings alone, while Formaldehyde and Hyena give us catchy rhythms that you could almost, possibly…dance to if you wanted. Don’t get me wrong though; the lyrics are still anything but stickers and hearts and glitter. Lead-off The Weight showcases the Editors that we have come to know over their records, and will be easily listening for any previous fan. In comparison to past works however, first off, there’s a tad of optimism in Tom’s voice that wasn’t there before that I certainly appreciate, and second, he shows a much fuller range on this record than he ever has before. Take the lead single A Ton Of Love – it’s wonderfully catchy and driving with his shouts of Desire! Desire!, and his position as premiere vocalist is captured in his delivery of countless lines. For example: Taken by force / Twisted fate / Well, what weighs more / Down on your plate – he slays them, and commands your raise your face. God knows that we tried. We’d have both been fine. Now we tear it to the ground. At the end of the final round. Every listen through this record, I love it more and more. You know how I know it’s beyond solid? The last two tracks on this record are The Phone Book and Bird of Prey. The former walks that blissful line of being uplifting and desperate in the exact same breath, showcasing a minimal backing guitar line that is guaranteed to make you feel some sort of emotion – though that emotion is going to change from ear to ear. The steady beat and simplicity that runs through the latter is more than a fitting ending. In this case, I have to say – if you’ve got any sort of refined palette (and I’m not saying that mine is perfect), you’ve gotta enjoy this record. Make your Echo and The Bunnymen comparisons all you want. Editors can more than easily hold their own.